Through two presidential Administrations (Republican and Democrat), I was illegally held in prisons all over America-- for 87 months. I was moved 29 times to hide me from legal assistance. What did I do? I spoke out about the erosion of our freedoms and though never convicted of any crime by any court of jurisdiction, I lost everything--family, wealth, reputation, and all that most people hold dear. In 2015 I moved to Eastern Europe to escape harassment under the Obama Administration, which threatened me with further imprisonment if I continued to speak out about the mass incarceration system. My book "Justice Restored: 10 steps to end mass incarceration in America" became an international bestseller in my absence, and I am pleased it is having an effect on the conversation (at the Trump White House), as I dearly love my country and what it once stood for-- Justice, Rule of Law, and Constitution--values abandoned by our courts. As explained in "Restoring America: by returning to its Constitution," (2018) the real cause of this erosion is something called 'Progressivism'--a plan to destroy our Constitution and replace elected government with professional bureaucracy to rule us--and this goal was nearly attained under the previous administration. I personally believe that President Trump is the first in many years--Republican or Democrat-- to have the courage to do something about it, and that is why I have given him my full support. 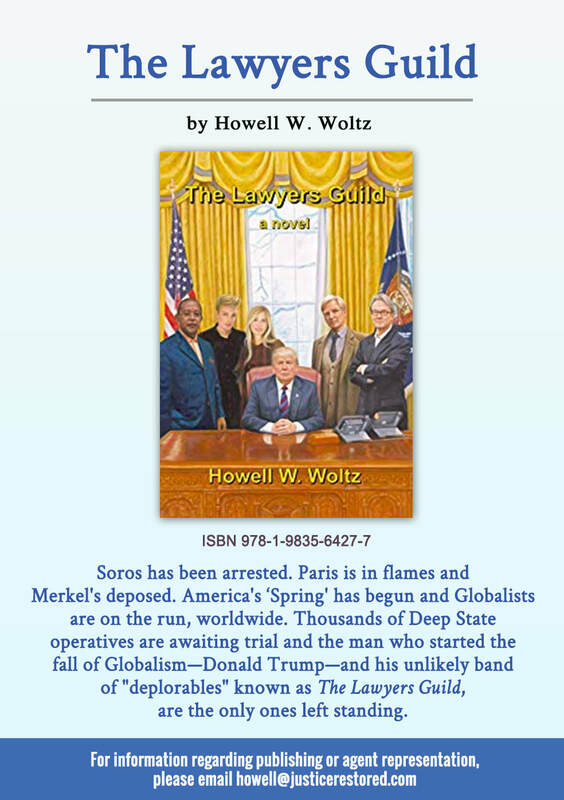 My latest book--and first novel--THE LAWYERS GUILD--is about Trump and his team taking down the Progressive cabal, worldwide. I hope you enjoy it! Early in the morning on April 18, 2006, with two children alone and asleep, Howell Woltz was kidnapped by the FBI. He was never shown a warrant, or told that he was under arrest. He was never convicted by any court of jurisdiction of any crime, yet was punished as if he had. Howell spent those years tirelessly working to reduce the sentences of other innocent prisoners and writing about the injustices he witnessed in a justice system that is now little more than a conviction machine. During a year of solitary confinement, Howell grappled with the question, “Why me?” The answer he received was, “Because you are supposed to do something about it!” He began detailing the injustices faced by those he met in the gulags of the largest prison colony on earth or in history. This is a story of betrayal in the ‘land of the free.’ It is a story of betrayal of our constitutional rights, the ideals set forth by our founding fathers, and the trust we put in our government. Howell’s story is a rallying cry for all Americans.